IRVINE, Calif.--(BUSINESS WIRE)--CoreLogic® (NYSE: CLGX), a leading global property information, analytics and data-enabled solutions provider, today announced updated residential and commercial loss estimates for the recent catastrophic wildfires in California. According to this new data analysis, total losses from the Camp Fire, the most destructive wildfire in the state’s history, are estimated to be between $11 billion and $13 billion. Total losses from the Woolsey Fire in Southern California are estimated to be an additional $4 billion to $6 billion. 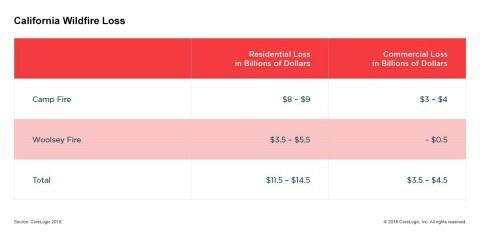 CoreLogic residential and commercial loss estimates for the Camp and Woolsey wildfires in California.